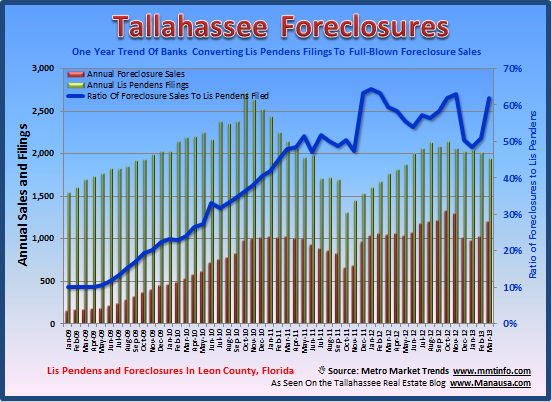 New lis pendens filings in Tallahassee fell 30% in March when compared to March 2012, and foreclosures rose 269%. The decline in new lis pendens filings is a relief, and it is the second declining month in a row. But the 251 foreclosures that occurred in March is nearly equal to the number of closed home sales for that same month! We are far from the finish line in this housing market recovery. The blue line in the graph below shows that nearly 2/3rds of all filings are ending up in foreclosure sale, possibly indicating that banks are approving fewer short sales and are willing to take the property back in order to sell it themselves.